But will they actually be any good? 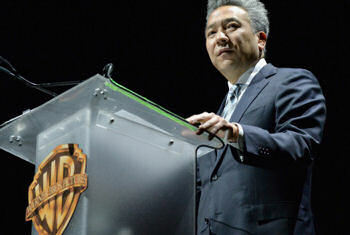 At a Time-Warner investors’ meeting today, Warner Bros. CEO Kevin Tsujihara unveiled a five year slate of films aimed directly at the hearts of fandom. Perhaps he was still playing coy, implying that there are plans for still more, including potential standalone Superman and Batman solo films. Though the meeting was covered by the site Deadline, it’s interesting that all this comes on the heels of New York Comic Con — where Warner Bros. kept mum — and definitely not in a way designed for maximum fan frenzy. This meeting was about finance — and how DC superheroes can help the bottom line.. Most of the films announced serve more as confirmations of long-standing rumors, but it also wasn’t just superheroes — Warner Brothers looks to keep LEGO and Harry Potter fans extremely happy as well. What has been controversial in fandom today, though really shouldn’t have surprised us, is how Warner Bros seems intent on keeping their movie franchises completely separate from their television counterparts. Yes, despite successfully launching Grant Gustin as The Flash last week on the CW, actor Ezra Miller will portray the character for the movies. Batman v Superman: Dawn of Justice, directed by Zack Snyder and starring Henry Cavill as Superman, Ben Affleck as Batman, and Gal Gadot as Wonder Woman. Amy Adams also returns as Lois Lane, important because she was mentioned as carrying over into the Justice League films. Oh, and there’s likely more — cameos from Ray Fisher as Cyborg, Ezra Miller as The Flash, Jason Momoa as Aquaman, and Jerry Mathers as The Beaver. Suicide Squad. David Ayer, writer/director of the upcoming Fury, will helm this movie that focuses on DC villains gathered together by a government agency to pull off Black Ops missions. The group already exists in one form on Arrow, but again, don’t count on any TV actors getting to pull double duty on this one. (You can also see another take in the recent direct to video Batman: Assault on Arkham.) Let’s put money on the line-up including team stalwarts Bronze Tiger, Deadshot, and Harley Quinn. I’ll throw in longshots Rick Flag and someone from the Flash’s Rogues’ Gallery — Captain Boomerang would be fun, and he is appearing on the TV show as well. Fantastic Beasts and Where to Find Them (Part 1) J.K. Rowling is writing the screenplays, David Yates is directing them, and all we really know is that we’re returning to the world of Harry Potter. It’s planned as a trilogy, allegedly set long before the days when young Harry would face off against Voldemort. However, Rowling recently tweeted an anagram that implies we’re going to see more of Harry, so it wouldn’t be too surprising if the story goes back and forth in time to allow Daniel Radcliffe to show us a little of heroic Auror Harry. The LEGO Ninjago Movie This likely will tie in directly to the series running on Cartoon Network, based on the specific line of LEGO toys that includes dragons, ninjas, and the deadly art of Spinjitsu. Deadly because of course it means that little bricks can go flying so that unsuspecting parents can step on them in the middle of the night. Wonder Woman. At last she’ll get her solo film, again played by Gal Gadot and promised to be in line with her New 52 origin as the daughter of Zeus. If that much is true, it’s a smart move on Warner Bros’ part to retain a little wonder in Wonder Woman. Just don’t tie it into your Clash of the Titans franchise, please. Justice League (Part 1) Zack Snyder rolls right from Dawn of Justice into this one, of which we know nothing. For years, it’s been rumored that Warner Bros would pit the League against Darkseid; the problem with that is that we’ve already seen a similar enough character from Marvel in the form of Thanos. Get weird, Zack — you’ve lulled us into grim and gritty, now throw something like Starro the Conqueror at us! A fanboy can dream. The LEGO Batman Movie From the team that brought us The LEGO Movie, it’s all plastic caped crusader. Will Arnett returns to voice Batman, not to be confused with but not necessarily contradicting the upcoming Cartoon Network movie LEGO Batman: Be-Leaguered. If it means more Jonah Hill as Green Lantern, bring it on. Aquaman My god, man, will you just do a victory lap around the pool? Momoa has been such a good soldier and magnificently reticent to confirm what everybody knew — he’s Aquaman. Will he be blond? We don’t know. Will he be good? THAT we have confidence in. This guy has charisma to spare and Aquaman needs it to sell to an audience that thinks he’s still just the hero who talks to fish. Fantastic Beasts and Where to Find Them (Part 2) To be fair, even if this trilogy isn’t that good, it will still likely be better than Fantastic Four and How to Ignore Everything That Made People Interested. The LEGO Movie 2 But will it still star Star-Lord? Cyborg This may have been the most surprising announcement. On the one hand, it’s a desperately needed move in popular culture, and a great opportunity for Fisher. On the other, Cyborg isn’t exactly a character who has carried any memorable solo stories in comics. But kudos to Warner Bros in their perceived competition with Marvel Studios. While Marvel did get Anthony Mackie in as The Falcon, he was still a supporting character, and they still have not confirmed a Black Panther movie (nor a Black Widow movie, for that matter). So at least Warner Brothers is committing to diversity years ahead of time. They probably won’t actually beat Marvel to the punch, but it’s a good move on paper. Green Lantern Considered to be a reboot even though it hasn’t been said one way or the other, Warner Bros could be readying a one-two punch. No casting has been mentioned for the Justice League franchise, so even though DC’s Chief Creative Officer Geoff Johns loves Hal Jordan (played previously by Ryan Reynolds), it’s time for John Stewart. That way they don’t even have to reboot if they don’t want to — just hand the ring off to Stewart. And this time, do justice to Green Lantern. Of the films we’d had rumored up to now, we have three pretty big absences. The Sandman Joseph Gordon-Levitt’s take on Neil Gaiman’s brilliant creation is nowhere to be seen, though both Nikki Finke and Kevin Smith swear they saw it listed as part of the plan once. However, The Sandman is a Vertigo property, likely to be R Rated, and Tsujihara may have it categorized elsewhere. Metal Men Light-hearted like Shazam could be, this story of robots with human emotions could be lying dormant until New Line either succeeds or fails with Shazam. Justice League Dark Actually, I think the last time this movie was referenced it was called Heaven Sent, but most know it as Guillermo Del Toro’s movie bringing together the supernatural elements of DC — Swamp Thing, The Spectre, Deadman, and John Constantine. But it always had one strike against it — only one out of every five or so Del Toro projects actually come to fruition. It also looks like NBC’s Constantine may cover a lot of the same ground Del Toro planned to do, though the director still claims it’s on his docket. And we’re back to TV, where despite all this movie hoo-hah, Warner Bros is really doing it right, regardless of which network has what. Gotham has had subtle references to Arrow and vice-versa, with the obvious connection to The Flash. Constantine may also tie in, but it’s dealing with a whole other corner of the DC Universe anyway.